SymSoft uses open frameworks to make data visualizations of health plan performance available on fixed and mobile devices and connect with the next generation of healthcare consumer. With more and more consumers making individual health insurance decisions, they need a better way to understand and compare their choices. Sifting through the myriad of health plan marketing sites and trying to figure it out is daunting. And, the Affordable Care Act (ACA) puts a premium on regulatory agencies providing ease-of-access to health plan performance information to aid the consumer. In other words, Consumers and the California Department of Managed Health Care needed to Connect. SymSoft worked with the client to pick the right technology for the job. Then we collaborated with the client to design a responsive digital dashboard accessible to consumers on their preferred device. Then we engineered the solution to scale for the California health insurance market and made it easy for staff to aggregate 1000’s of data sets into a user-friendly visualization. Per usual, we designed for “accessibility to all” and meeting the requirements of the American’s with Disabilities Act Section 508 and Web Content Accessibility Guidelines (WCAG). 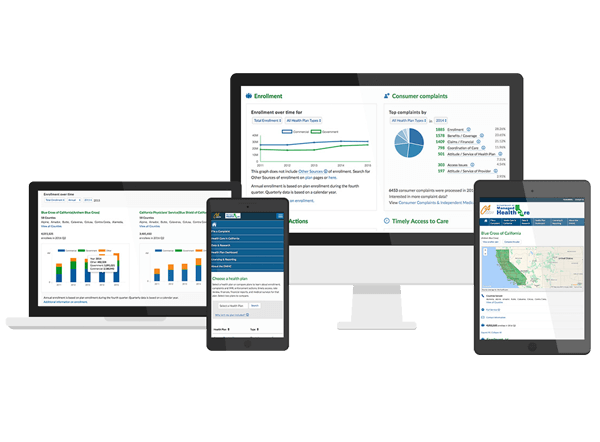 The health plan dashboard connects Californians to critical health plan performance data maintained by the State using their preferred device, making it easier and more convenient to find the right health plan for them and their family.